May 27, 2012 marked 75 years for the Golden Gate Bridge and a wonderful opportunity to recognize the history, beauty, and ingenuity of this famous span. 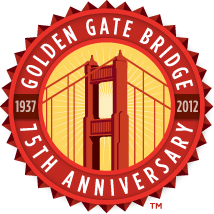 The Golden Gate Bridge, Highway and Transportation District and the Golden Gate National Parks Conservancy—in cooperation with the National Park Service, the Presidio Trust, and the City and County of San Francisco—launched a 75th anniversary program. Events continue throughout the year. The program was designed not only to commemorate the Bridge but also to celebrate its unsurpassed setting and unique place in the hearts and minds of Bay Area residents and fans from around the world. A spectacular festival was held on the 2012 Memorial Day weekend. Recalling the historic "Golden Gate Bridge Fiesta" in 1937, the event told the story of the Bridge and provided an opportunity for the entire community to celebrate together. Leading up to and following the 2012 Memorial Day weekend, many civic, cultural, and educational organizations produced their own tributes to the Bridge. See a list of community tributes. Marketing and social media campaigns brought the story of the anniversary and the community tributes to millions of people around the world. A Kids to the Bridge program provided an opportunity for Bay Area youth to learn about the famous span in conjunction with other education programs. The southeast plaza (San Francisco side) at the Bridge has been transformed into a world-class destination, featuring a new Bridge Pavilion housing interpretive materials, memorabilia, and other high-quality merchandise; a revitalized gathering space, guided walking tours, outdoor exhibits, improved signage and parking, and restored vistas. View site improvement. The Bridge Round House has been converted from a gift shop to a space for tours and visitor programs. Personally guided Bridge tours are now available. The tour program includes the first-ever evening tour of the Bridge. The tours bring to life the people behind the Bridge, the genius of its engineering, the lessons of its accomplishment, and the facts and myths surrounding the famous span. In addition, a commemorative photo program now provides a great way for visitors to create a lasting memory of their trip to the Bridge, even on the foggiest days. Original plans called for tearing down Fort Point to make way for the south anchorage. Chief Engineer Joseph Strauss, who called the fort a perfect model of the mason’s art, redesigned the anchorage and built an arch over the fort.